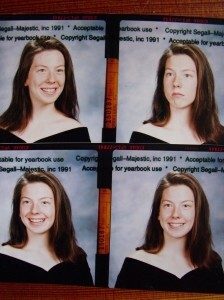 These are really Frida Berrigan’s graduation photos. Courtesy of the author. Last weekend was my 20th high school reunion. My growing family and I — eight months pregnant next week — made the sojourn down to Baltimore for the festivities. It is incredible that 20 years has passed since I walked across the stage in the well-used auditorium at Baltimore City College High School. It was a good day. Not to brag, but I was in the top 20 in my class, won the English Department Award and the class voted me “Most Down To Earth.” I took it as a compliment, but I think it meant I was not all that interesting. The hotly contested categories were Best Dressed and Sexiest. I rode a bicycle the three miles to school most of the last two years and did not take a shower or change when I arrived, so I was not getting either of those prizes! The reunion was a blast. Loud music made deep conversation or even superficial catching up impossible, so we resorted to hugs and gestures of delight. My former classmates greeted me warmly, and no one recalled a particularly embarrassing incident in freshman year English class. The food was great, people were dressed to the nines, beer and wine were free (so was club soda, my beverage of choice for the evening), and everyone danced until the wee hours of the morning — many on four or even five inch heels. And the academics were (sort of) rigorous. We took two years of Latin and two years of another language. The Latin was a holdover from the school’s days as an all-boys academy. It was part of our “heritage” but it also functioned to help prepare us for the word section of the SAT tests. (Despite the fact that both of my parents essentially “spoke” Latin as a former priest and nun who grew up in the pre-Vatican II Days, I came close to failing Latin both years.) Part of our tradition was the reciting of the Pledge of Allegiance in Latin — though I never fully learned it because I never participated in the Pledge. But every once in a while — unbidden — a random phrase will enter my head: Fidem mea, obligo vexillo civitatium Americae. The school celebrated its 150th anniversary while we were enrolled. Our mayor and governor at the time had both graduated from City. But so did Alger Hiss. Our annual Thanksgiving football game against arch rival Baltimore Polytechnic Institute was epic, much anticipated, and held in Memorial Stadium (across from the high school) where the Colts and the Orioles both played until the Colts left for greener pastures and the Orioles convinced the city they needed Camden Yards. When I was a junior, President George H.W. Bush declared war against Iraq. The local chapter of American Friends Service Committee quickly organized a nightly candlelight vigil and my friends and I joined up. It was hard to maintain Quakerly silence when you’re standing next to your friends and cute boys… but someone was always on hand to shush us into mindfulness again. I can’t remember anyone at the school being pro-war. Classmates and I organized buses down to D.C. for the big marches and demonstrations, and lots of kids participated. Our efforts at education were also really successful, with standing-room-only crowds for films and speakers after school. I did not stop to think at the time that this was rare or noteworthy. It made sense to me that the majority of my school would be anti-war. A lot of my classmates had friends or relatives in the military, and we all worried about kids just a few years older than us who had enlisted in the military. They had been tempted by signing bonuses, employable skills and the long stretch of relative peacetime that was so violently ruptured on January 17, 1991. And now they were headed off to war. It was sort of fun to be high school activist (although it meant a lot of dodging the Refuse-and-Resist, super-sectarian socialists). Growing up at Jonah House meant being exposed to planning meetings, political discussions, helping to “run off” (yep, on a mimeograph machine) leaflets, and going to lots and lots and lots and lots of demonstrations. But now I was helping to organize those demonstrations, I was helping to draft those flyers (on a computer!! ), and I was encouraging my peers to come out and participate — I was invested in them having a good protest experience. We brainstormed slogans, made signs and painted banners. For the first time, I did not just feel different or strange as the white kid growing up in a radical Catholic nonviolent community. I felt like that difference and strangeness was useful. That war itself did not last long (George H.W. Bush declared victory at the end of February the same year), but it was followed by a decade of sanctions that crippled and killed the civilian population while keeping Saddam Hussein strong. And that was followed by another round of war, this one much more protracted, much more deadly for all sides and still far from over. I think many of my classmates continued to follow what happened after that war “ended” because we had all been so active. Even now, although U.S. military personnel have largely withdrawn, the violence continues. On Wednesday, a wave of bombings throughout the country claimed 83 lives and wounded more than 300. We graduated the next year; all but a few went on to college, mostly four year schools with some sort of pedigree: Columbia, Northwestern, Boston College, Dartmouth, Howard, Morehouse, Spellman, the University of Maryland schools, … oh yeah: and Hampshire College (no pedigree there, but lots of sheep). There are lots of great movies made about high school reunions. Grosse Pointe Blank is the one I like best. Romy and Michele’s High School Reunion was pretty awesome too. But, I don’t have anything to prove to my former classmates; I’m not haunted by deep angst about high school or preoccupied by raw unfinished business. So, it is unlikely that a movie will be made about the Sheeberrigaumeran (Frida Berrigan and Patrick Sheehan-Gaumer mash up, get it?) reunion night. But, I was grateful to be able to see all my old classmates — happy, whole and looking fabulous — and to reflect on the moment so long ago when I realized that my upbringing — strange and different though it was — had genuinely prepared me for a life of nonviolent resistance and community building. Glad you liked the high school experience. I enjoyed JUNIOR high school better, where a bunch of us published an underground newspaper and cleared the school district of grapes and lettuce. High school was a bummer, and most of the other students now say, “He’s still a nut in his fifties!” Ho Hum… Glad to know all of you and I have no regrets about being a teenage activist, altho I wish I had not been so naive about career opportunities in the Movement! See everybody at the next protest! “I would have made a good pope.”–Richard M. Nixon. Wow. I’ll try to resist my natural tendency to resent everybody who enjoyed middle school, because I assume they were the same people who helped me make it miserable for myself. My first internship, in high school, though, was with Pacifica Radio, right at the height of the period when the network was eating itself alive. It was helpful to know ahead of time, and to have no illusions otherwise, about the tendency of American leftists to cannibalism.